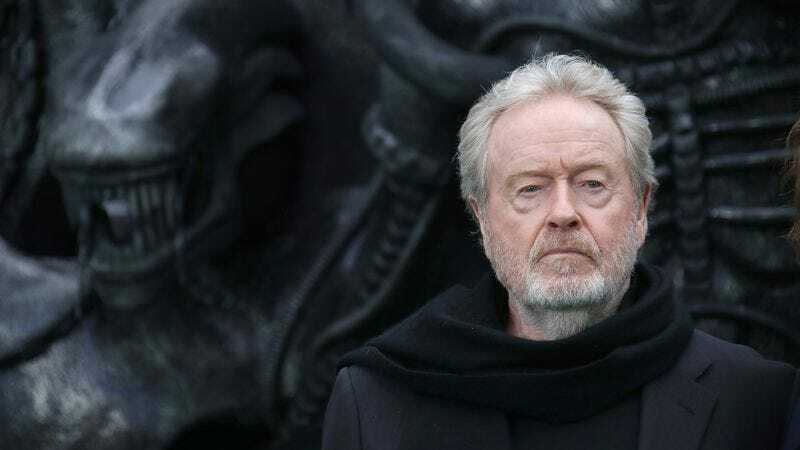 Alien: Covenant isn’t even out yet, but Ridley Scott really does plan to follow through on his repeated threats to keep making Alien movies until the human race is wiped out by some extraterrestrial menace. Back in March, we reported that Scott said he’ll be “ready to go again next year” in terms of making another Alien movie, and in a recent interview with Yahoo! Movies UK (via Screen Rant), he reiterated that point and actually offered a specific timeline for the future of the series. Apparently, Scott thinks he’ll be able to start filming the next movie “within a year,” and it’ll be in theaters “within a year and nine months.” That’s really soon, considering it took five years for Scott go from Prometheus to Covenant, but that’s just how enthusiastic he is about suddenly being part of the Hollywood franchise machine. Scott says that the whole moviemaking process “opens up and starts to evolve” when you’re making franchises—with him presumably failing to recognize the parallels between those specific verbs and the way his Xenomorphs are born—and it’s just “weird” when “writing, doing, planning, thinking about franchises” all the time. Basically, it sounds like Scott is diving headfirst into the waterslide of blockbuster franchises, and as long as the water (or money) continues to flow, he’s just going to smile and keep zipping through each twist and turn with more and more Alien movies. This whole setup is probably very good for Scott, but it’s definitely not good for Alien 5. Since Scott is so enthusiastic about continuing his Alien prequel series—with Prometheus, Covenant, and however many Covenant sequels he makes before the timeline catches up with his original 1979 movie—it doesn’t leave any room for the Alien 5 project that Neill Blomkamp was hoping to make a few years ago. That’s almost certainly why Scott says that project is no longer happening, so if we go back to the waterslide metaphor, this is like Scott shooting down as fast as he can and then pushing Blomkamp over the side. That’ll get you kicked out of most waterparks, but things work a bit differently in Hollywood.